Just back over the weekend from Rwanda where we were filming a campaign for Lessons For Life (Education Changes Everything) alongside Chris Leslie, a friend as well as talented Filmmaker and Photographer. Whilst the film is still going into post we thought we would share some snaps taking during the week there. Just a wee series I was editing on starting tonight. I was laughing the other day when I came across a blog (google sh*tting sparkles blog) where the details of working in post production are mulled over. Not a comedy editor, or a documentary editor, or a music video editor. I am an Editor. I train myself in telling stories in different forms. At every editing seminar I attend, the question of avoiding being pigeon-holed is always asked. It’s hard to avoid being pigeon-holed. Producers want someone proven in whatever style they are looking for. I am constantly proving myself with each new producer and each new type of show. I have been able to figure out different editing styles and have been successful at being hired on different types of shows such as documentary, scripted, reality, package editing, and multicam studio show format. But here’s the thing, each type of editing has its own unique techniques. Each show requires a different approach and works different editing muscles. So if I practice in one genre of editing, then I am going to be better at that particular style. There are lots of editors out there known for a specific genre of editing such as cutting promos or reality tv or scripted narrative. That is great if that is their specific editing passion, but I hear stories about how very few editors are able to go back and forth between reality and scripted and thus are not able to get as much work as they would like. I often work on shows with very fast turnarounds. My average gig is 3 weeks. Sometimes in between my longer gigs, I fill in for other editors on different shows for a day or two. So in one week, I will have worked on a multicam studio show, a documentary, online editing for another show, and doing a recut on an old show that requires me to punch into program masters and make big changes seamlessly without changing timing. Within that week of one day gigs, I will have done music editing, dialogue editing, picture editing, mastering, color correction, multicam editing, and worked with 5 different producers each with their own personality quirks and preferences. My unpredictable work schedule requires me to keep every skill I acquire sharp. And I still have so much to learn. I approach everything with a beginner’s mind as much as I can. Being open to new ideas helps me think outside the box and keep my creativity going. Every project is a new adventure to explore the possibilities of storytelling. What are your thoughts on that? Precious Productions is in the business of corporate advertising, factual entertainment and documentaries. We like it that way. Amber Fares’s rubber-burning documentary follows an all-female Palestinian motor racing team (the first) as they compete with and against each other in wheel-spinning time-trials. “It’s like we put the pepper on the food,” one petrolhead explains. “The race without girls – it’s no fun.” Social conventions are overturned (one internet troll describes the women’s success as a sign of the apocalypse) as the Speed Sisters carve out their own space in occupied territory. But things take a turn for the dramatic when Israeli soldiers take aim at the women en route to a training session, and alarming injuries are sustained on-camera. There’s some nail-biting internecine tension as a climactic race result goes down to the wire, but the overall tone is celebratory and affirmative. “The eyes are the windows of the soul” – this quote has been attributed to countless different historical figures. In the first split-second that we observe someone, our gaze often snaps directly to their eyes – in an attempt to figure out who they are and what their intentions are. The eyes can often communicate truths about an individual and about their soul that cannot be fathomed by something as inadequate as human language. It’s been a complicated and exciting year in advertising. We’ve seen marketing campaigns masquerading as products, sculptures and even entire shops, but the traditional worlds of TV and film have flourished too. Here are our favourites this year. Diesel launched a new brand language this year, which emphasised its irreverent heritage and was used across posters, print and also in unexpected media such as Tinder and Shazam. Lastly Shiseido’s short film is remarkable because it is so risk taking within the quite traditional and regimented beauty sector. The film is cleverly shot too – apparently filmed in one take over several hours, its reveal keeps you gripped until the end. Compelling film. Watched a film on Netflix the other night. This is a story based on groups like Boko Harem, lords resistance army and more lately ISIS and the Kurdish YPG. 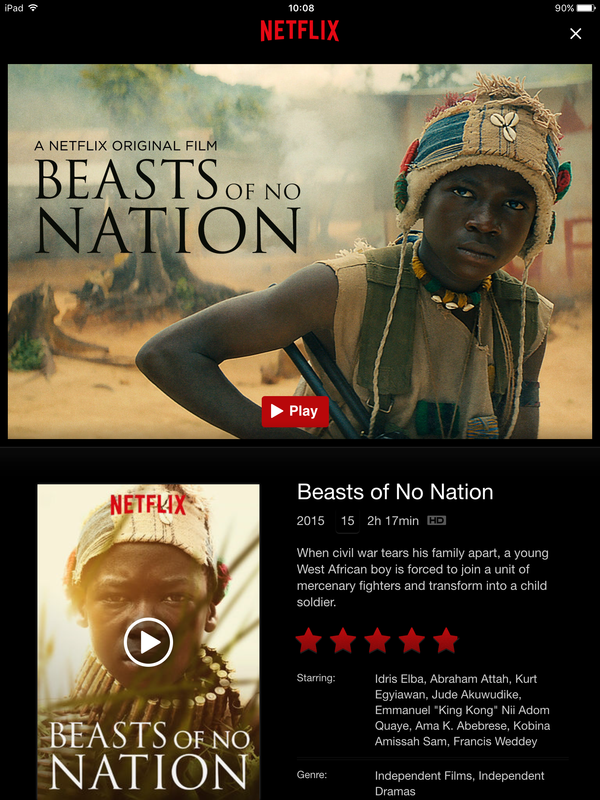 It tells the story of a young boy acted by Abraham Atta (who gives the best performance of any actor I have seen in years) whose father and brother are killed and flees only to be captured and indoctrinated into a rebel group. Harrowing, violent, disturbing, compelling. Definitely puts Hollywood fluff and films like the awful recent James Bond to shame.